The General Board, chaired by the President of the ECB, Mario Draghi, is the ESRB’s decision-making body. It discusses current macroprudential developments and, where necessary, issues recommendations and warnings. The Steering Committee supports the organisation of the General Board meetings. 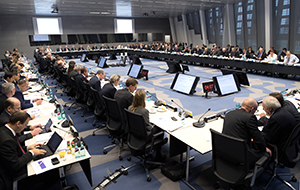 It reviews analysis presented by the ESRB advisory bodies (Advisory Technical Committee and Advisory Scientific Committee) and discusses the macroprudential policy agenda of the ESRB. The Advisory Technical Committee (ATC) provides advice and assistance on issues relevant to the work of the ESRB. The Advisory Scientific Committee (ASC) conducts research to inform macroprudential decisions by the General Board. Its findings are published regularly in the ASC Reports. The ASC also runs the ESRB Working Paper Series and the Ieke van den Burg Research Prize. The Secretariat is responsible for the day-to-day business of the ESRB. It provides administrative, analytical and statistical support to the ESRB’s committees.